In 2005 the BeerGun® bottle filler revolutionized the way homebrewers bottled their kegged beer. Complicated counter-pressure fillers were obsoleted, and bottling became effortless and enjoyable! The patented BeerGun® bottle filler became the overwhelmingly dominant filler of choice and we’ve helped tens of thousands of homebrewers bottle beer and win countless brewing awards. Something we’re very proud of. But at Blichmann Engineering we listen to homebrewers! We’ve taken your feedback and have created the New BeerGun® bottle filler! More ergonomic, faster and easier to clean, and even more intuitive! The new BeerGun® makes filling a bottle as simple as a press with your thumb for CO2 purge valve and pull of a trigger for beer! One-handed intuitive operation – so simple it’s patented! Everything that touches the beer is stainless – no brass in the product period! Comfortable grip stays warm during use. Lowest-foaming and lowest oxygen pickup design on the market period! Anti-microbial beer hose keeps contamination at bay. Lower oxidation levels than nearly all commercial bottle fillers means long shelf life for your beer! 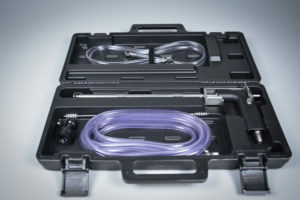 Includes convenient tool case to store the filler, hoses and accessories. So easy you’ll actually enjoy bottling!